Two of the three figures that make up the Secret Site which I have also seen referred to as the Observer Panel. 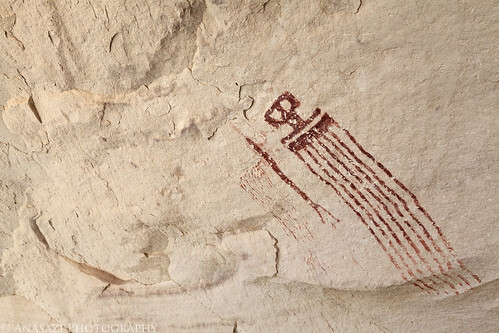 Hidden in a shallow alcove in the San Rafael Swell, these are an exceptional set of Barrier Canyon Style pictographs with the main larger anthropomorph styled in a simple rake-like motif which is believed to represent rain. The smaller stick figure helps reinforce the rain interperetation since it appears to be pouring water from its hands. There is one more anthropomorph that is off to the right and out of the frame in this photo that looks similar to the large rake-like figure, except a bit smaller.